Marilyn Monroe in a troubled, far-away moment, captured by Richard Avedon, NY, May 1957. “Candle in the Wind” is a name of a song performed by Elton John and written by he and collaborator Bernie Taupin in 1972. The song was originally written as a tribute to Hollywood movie star Marilyn Monroe who died at the age of 36 in August 1962. Taupin had been inspired by the phrase “candle in the wind” when he heard someone use it to describe Janis Joplin, the blues-rock singer who died of a heroin overdose in 1970. In Monroe’s case, too, the phrase was especially appropriate, given her tumultuous life and untimely death. The song’s opening line, “Goodbye Norma Jean” refers Monroe’s real first name, and the lyrics chronicle her troubled life as a film star and international celebrity. John and Taupin’s “Candle in the Wind” aptly captures some of the tragedy and mystique that was Marilyn Monroe, and the long-standing public fascination with her life. 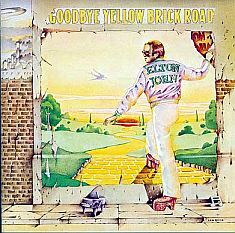 Elton John's 1973 album, 'Goodbye Yellow Brick Road,' included 'Candle in the Wind'. “Candle in the Wind” was first released on Elton John’s 1973 album Goodbye Yellow Brick Road and also appeared on later albums. A single version of the song reached No. 11 on the U.K. charts in 1974. It wasn’t released as a single in the U.S. until 1987, when a live version from Elton’s Live In Australia album charted. In 1990, the song rose to prominence again when John rededicated it to AIDS victim Ryan White, performing it in his honor at the Farm Aid 4 concert and at White’s funeral. But in 1997, following the death of Princess Diana, John did a remake of “Candle in the Wind” as a tribute to Diana, a personal friend. This version of the song, with new lyrics, was released as a single and sold wildly throughout the world, peaking at number one in almost every country where it was sold. That part of the story continues below the lyrics and photographs that follow. 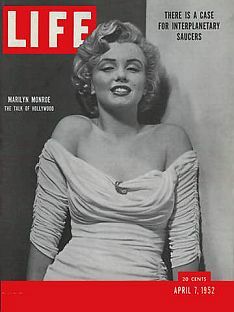 April 1952: Monroe on cover of Life. Candle in the Wind - single sleeve cover, 1974. 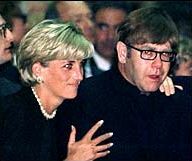 After Princess Diana was killed in a car crash in Paris, France on August 31, 1997, Elton John, who had been a very close friend of Diana’s and the Royal Family, went into a period of shock and mourning. Only a month prior to Diana’s death, John had been rocked by the passing of another friend, Italian designer Gianni Versace, a funeral which he and Diana attended in Milan on July 22nd. Princess Diana & John at Gianni Versace's funeral, July 1997. For our nation’s golden child. 'Candle in the Wind,' Princess Diana version, 1997. Elton John & Princess Diana in happier times. 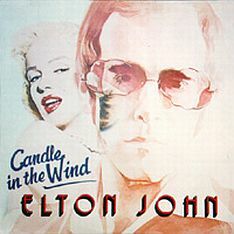 “Candle in the Wind 1997” carried the label of Elton John’s Rocket Records and was distributed by Hollywood-based A&M Records, a unit of PolyGram. Before the CD shipped, there were reportedly orders for more than 12 million copies in the U. S. alone. By late September 1997, the song took the American pop charts by storm, entering the Billboard Hot 100 at No. 1, smashing the existing record for first-week sales with nearly 3.5 million copies sold over six days from its September 22nd release.At its peak worldwide, the Diana version of “Candle in the Wind” was selling at an estimated rate of nearly six copies per second. The previous first-week sales record of 632,000 had been set in late December 1992 by Whitney Houston’s “I Will Always Love You.” All in all, “Candle in the Wind 1997” sold over 11 million copies in the U.S. In the U.K. sales also soared. In its first week the song sold 658,000 in one day, and over 1.5 million copies for the first week. The single would remain at No. 1 in the U.K. for five weeks and eventually sold 4.86 million copies there, becoming the best-selling single of all time in the UK. In Canada, it spent 45 weeks at the top spot and three years in the top 20. Worldwide, it is estimated that the single sold more than 35 million copies. At the peak of its sales, worldwide, it was estimated that nearly six copies were sold every second. 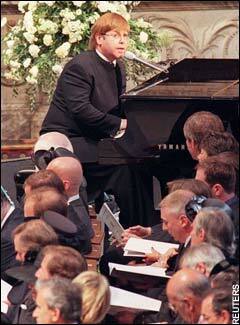 John performing 'Candle' at Diana’s funeral. "The Mirror" newspaper of Sept 13, 1997 giving a boost to "Candle 1997." As of 2006, “Candle in the Wind, 1997” was ranked as the world’s best-selling CD single in history. Bing Crosby’s “White Christmas” was still ranked as the world’s best selling vinyl single. 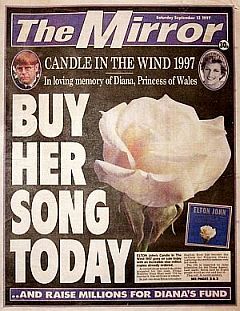 All artist and composer royalties and record company profits from “Candle in the Wind 1997” were donated to “The Diana, Princess of Wales Memorial Fund.” Many music store retailers, however, did profit on their share of the song’s sales. 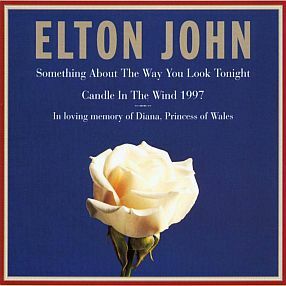 Elton John sang “Candle In The Wind 1997” in public, for the first and only time at Diana’s funeral in Westminster Abbey on September 6th, 1997. John has repeatedly turned down requests to perform the song live and it has never been released on any of his albums. However, he has stated he will perform the song again if requested by Diana’s sons, which to date has not occurred. At concerts, John performs the original 1973 version. Princess Diana, "cover girl," People magazine, Sept 15, 1997. “Candle in the Wind” and “Elton John,” Wikipedia.org. Richard Harrington, “Elton John: Diana’s Song,” Washington Post, Friday, September 5, 1997; Page D-2. Bill Carter, “Elton John’s Revised ‘Candle,’ For a Princess and Charity,” New York Times, September 9, 1997. Reuter, “Elton John’s Diana Tribute Ignites U.S. Charts,” October 1, 1997. Jon Pareles, “October 19-25; Roll Over, Bing Crosby,” New York Times, October 26, 1997. Warren Hoge, “London Journal; Two Years On, Diana Is the ‘Forgotten’ Princess,” New York Times, September 1, 1999. The Diana, Princess of Wales Memorial Fund.